Practice C# questions and answers for interviews, campus placements, online tests, aptitude tests, quizzes and competitive exams. This set of C# Assessment Questions and Answers focuses on “Accessor controls of class”. 1. Which among these access specifiers should be used for main() method? Explanation: main() method must be specified public as it called by Csharp run time system outside of the program,by default main is private in nature if no access specifier is used. 2. Which of these is used as default for a member of a class if no access specifier is used for it? 3. What is the process by which we can control what parts of a program can access the members of a class? 4. Which of these base class are accessible to the derived class members? 5. What will be the output of the given code snippet? Explanation: ‘y’ is defined privately which cannot be accessed outside its scope. 6. What will be the output of the given code snippet? 7. What will be the output of the following set of code? Explanation: Here, a = 2, a + 1 = 2 + 1 = 3. So, a = 2, b = 3.
x = 2 + 3 = 5.
y = 5 + 3 = 8. Similarly, a = 5, b = a + 1 = 4.
y = 5 + 4 = 9. 8. What will be the output of the following set of code? 9. Which of these access specifiers must be used for class so that it can be inherited by another subclass? Explanation: private members of a class cannot be inherited by a subclass. 11. What will be the output of code snippet? 12. Accessibility modifiers defined in a class are? b) public, internal, protected internal. c) public, private, internal, protected internal. 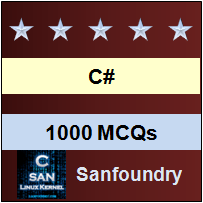 Sanfoundry Global Education & Learning Series – C# Programming Language. To practice all areas of C# Assessment Questions, here is complete set on 1000+ Multiple Choice Questions and Answers on C#.